Kyle has officially inspired me. If his series Crossing the Stream has accomplished anything (and it has, if you’ve been paying attention), it has convinced me that I too should try and exercise more while consuming media. Normally I’d consume junk food while consuming my media, but it’s a lot harder to eat when you’re on an exercise bike. Since Kyle’s got TV shows covered, I figured I’d look at something a bit more my speed: video games. Like any other gamer, I have an ungodly backlog of games just waiting for me to boot up, and some even to unwrap. But before turning to the games, I had to actually get an exercise bike and, let me tell you, those suckers cost a lot more than I’d expected for a bike that just sits there and doesn’t go anywhere. My goals are a lot more basic than Kyle’s. For one, I’m not trying any dietary changes. For two, I’m also not even weighing myself so I’ll have no clue whether my exercising is having the desired effect. My goal is simply “to be exercising while playing a video game.” Thankfully, my wife was clever enough to quickly scour the local buy/sell groups and found me a bike perfect for my devices, so I’m good to go. With the equipment in place, I just had to select something from my backlog to play, which means naturally I instead decided to play a game I’ve played half a dozen times before. Let’s play Super Mario RPG: Legend of the Seven Stars! Mario RPG is my second favorite game of all time. I remember the previews in Nintendo Power getting me jazzed to play it, but when I ran down to the video rental section of my local grocery store (ah, the '90s! ), I was totally unprepared for the type of game I was getting into. Silly me, but the title “Super Mario RPG” really did mean “this is a role-playing game and will play like an RPG, dumb-dumb.” I’d never played an RPG before, so I was hopelessly lost and only made progress during my rental by playing on other save files from players far smarter than I was. It wasn’t until a few years later when I got the bug to actually try it again. The choice was simple, as SNES games were $1.00 for three days. After a month of riding my bike to the Albertson’s store every three days to rent the game again, I finally managed to beat Mario RPG, and then a few years later when they announced they were clearing all their old catalog out and selling their games, I snatched my copy for an outrageously cheap price. Hey, it was my copy, after all. On this playthrough, I’ll probably notice a lot more than in previous passes through the game. I’m still in awe of the intro Attract Mode since it shows an obscene amount of content that yes, you as the player will get to experience in one way or another. It introduces you to the weird graphics and view, the battle concepts, and shows the main characters, namely the addition of Mallow the “frog” and Geno the “please put this character into Smash Bros already.” I start my pedaling and the adventure begins. The whole intro leads you to believe that things will progress about as you’d expect from a Mario game. You encounter Goombas and some armored Koopas and some other series stalwarts before getting immediately to a Bowser brawl. I’d forgotten that the game doesn’t even give you the option of a tutorial until after this opening segment, even though you can indeed get rekt if you’re not being careful. Fighting Bowser presents the first real trick of the game. You discover immediately that you’re not meant to beat Bowser directly but instead intended to solve a basic battle puzzle by attacking the kink-link holding his chandelier rather than fighting one-on-one with the Koopa king. It’s a weird feeling to succeed in rescuing the princess in the first five minutes of the game, but even weirder when the sky suddenly shakes and a giant sword lands straight dab in the middle of the castle, setting the real plot in motion. As a kid, I thought the sword was named Smithy, but it’s actually a character named Exor, which we’ll get to much, much later. For now, Exor busts the bridge to Bowser’s Castle and forces Mario to return to the Mushroom Kingdom and tell the chancellor that Toadstool is still missing. Between Mario crashing into his house and having to explain to Toad what just happened, and then later attempting to explain the situation to the chancellor without actually speaking, we get a taste of the bonkers humor Mario RPG will deliver. Even twenty years later, I’m grinning like a goober as Mario hops around, imitating Exor and his encounter while all the Toads run and hide. I also get my first party member in Mallow, the game’s de facto mage. Mallow is the classic all-special archetype whereas Mario is sort of the Jack-of-all-trades character, which makes sense as you cannot switch Mario out of the party. Adding Mallow gives you more options in battle and introduces the relatively basic strategies you’ll start using in the early sections of the game. He’s physically not very powerful, but his thunderbolt attack can pop a whole group of enemies if he’s properly leveled. 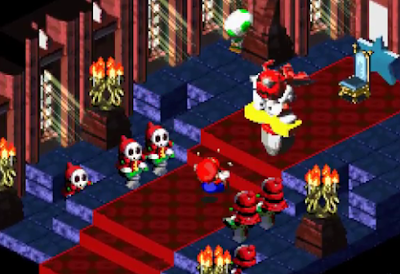 Speaking of battle, Super Mario RPG has forever ruined me for RPGs, because I want every one of them to include some sort of timing-based attack/defense system. The Paper Mario and Mario & Luigi games would go on to really maximize this concept, but Mario RPG got it so right so quick. Simply put, when attacking, you can press the A button at the correct time to add more damage to a hit, or press the A button right as an enemy attacks to reduce the damage. It keeps me engaged in basic encounters way more than most RPGs, and regardless of which RPG I play these days, I find myself absentmindedly pressing the attack button in rhythm, expecting more damage or greater accuracy as a result. Once joining with Mallow, I’m off to chase down Croco, a local dapper thug crocodile who’s stealing people’s wallets and who stole Mallow’s Frog Coin. As a kid, this is as far as I could generally get on my own, but now heading to Bandit’s Way and bopping Croco is as simple as fighting each enemy I see in the area to level up and then just hitting the correct timing in my Croco battle. So far, things seem fairly simple. But getting the wallet and Frog Coin only complicates things as my return to the Mushroom Kingdom is right in the middle of an invasion. The Smithy Gang has captured the entire town with a bunch of Shysters (Shy-Guys on pogo sticks), and it’s up to me to clear them out and rescue the chancellor. This is where leveling Mallow payed off in spades. Shysters are annoying little buggers, and between Mario and Mallow, it can sometimes take two turns to kill a single one. If Mallow’s level is high enough though, his Thunderbolt attack pops all of them in one shot, which makes the first boss ludicrously simple. One of Smithy’s generals, Mack, is a knife who’s taken control of a star that fell from the sky. I didn’t get the Mack the Knife joke as a kid, but now I’d just tickled pink, even if Mack is zapped into oblivion without my team needing a single heal. One star down, more to go! I mean, I know there are seven, hence “Legend of the Seven Stars,” but the game hasn’t told me anything yet. 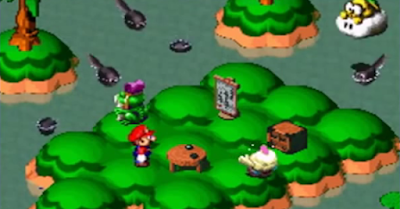 Point is, the first world zone of the game is complete and Mario and Mallow are heading to Kero Sewers. As for me, I’ve been pedaling for about an hour, so I’m ready to rest.